There was this naked light bulb next to our entrance that for a long time had been waiting for some compassion. For almost one year we have been living here, but more urgent needs took over, and I hadn’t found a lamp I liked. I decided to at least cover that bulb, it looked horrible and it’s the one closest to the front door. 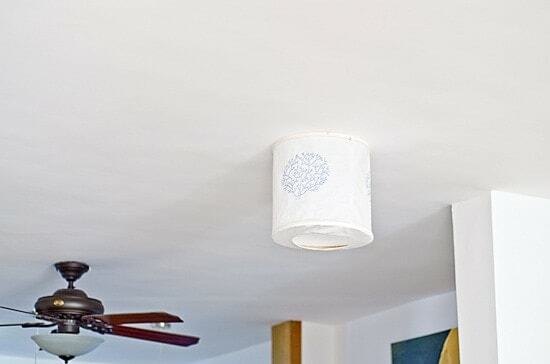 So let me share my idea for a DIY fabric ceiling lamp. You can decorate any lamp using the same pattern. This is what I drew on the lamp. You can download a printable size. It would look pretty nice on a cushion, perhaps I will do that next. I used fabric markers to do this, first testing it on a scrap of fabric, then I drew the motif on the fabric itself (which was a pretty thin, inexpensive cotton). Some markers require that you iron the fabric afterwards to fix the ink. In any case, it’s a great idea to wash and iron the fabric prior to starting. I used large embroidery hoops to give the lamp its shape. The mechanism that holds the lamp to the ceiling is pretty simple, but it’s not what I wanted to show you anyway. You would have to stand right under the lamp to see the bulb, so it’s pretty hidden now. I am using a low-consumption bulb, heat and fabric do not go well, however well-ventilated this lamp is. This was another simple, quick project, and pretty rewarding at that. It looks a million times better than a naked light bulb, and requires zero meddling with electricity. If anyone is interested, let me know and I’ll post a few more details on how I made it, in case you would like to try it too. its such a great idea! love your lamp. Love the lamp. So simple and elegant. That is very cool. I would love to see some more detail about the construction.